Advances in cancer treatment allow women to be cured and live longer. However, the necessary chemotherapy and radiotherapy regimens have a negative impact on future fertility. Oncofertility has emerged as a new interdisciplinary field to address the issue of gonadotoxicity associated with cancer treatment and to facilitate fertility preservation, including oocyte and ovarian tissue cryopreservation. These fertility issues are often inadequately addressed, and referral rates to oncofertility centers are low. The aim of this study was to report the 3-year experience of the San Raffaele Oncofertility Unit. A total of 96 patients were referred to the Oncofertility Unit for evaluation after the diagnosis of cancer and before gonadotoxic treatment between April 2011 and June 2014. Of the 96 patients, 30 (31.2%) were affected by breast cancers, 20 (20.8%) by sarcomas, 28 (29.2%) by hematologic malignancies, 13 (13.5%) by central nervous system cancers, 3 (3.1%) by bowel tumors, 1 (1.0%) by Wilms’ tumor, and 1 (1.0%) by a thyroid tumor; 47 (49.0%) were referred for oocyte cryopreservation before starting chemotherapy, 20 (20.8%) were referred for ovarian tissue cryopreservation, and 29 (30.2%) were not recruited. The mean time between the patients’ counseling and oocyte retrieval was 15 days (range, 2–37 days). The mean time between the laparoscopic surgery and the beginning of treatment was 4 days (range, 2–10 days). The number of patients who were referred increased over time, whereas the rate of patients who were not recruited decreased, showing an improvement in referrals to the Oncofertility Unit and in the patients’ counseling and understanding. Our results indicate that an effective multidisciplinary oncofertility team is necessary for prompt referrals and treatment. In women, approximately 10% of cancers occur in those <45 years old. Over the past years, major diagnostic and therapeutic advances have markedly improved survival rates of cancer patients. Indeed, during the past 5 years, the overall mortality attributable to cancer in women has fallen by >1.6% per year. The increasing number of cancer survivors draws attention to the long-term effects caused by cancer treatment and its impact on quality of life. Premature ovarian failure is one of the major sequelae of cytotoxic chemotherapy and/or radiotherapy in female children and young women, depending on the follicular reserve, the age of the patient, and the type and dose of the drugs used[3,4]. Sperm banking for post-pubertal males has been available for many years and the preservation of fertility for males is well established. In addition, young men who survive cancer have been shown to feel less distressed and more able to cope with cancer therapy after having previously cryopreserved their own sperm. In contrast, the options for fertility preservation in females have been developed more recently and are less known. Consequently, a discussion about the potential reproductive health issues with this group of patients at the time of diagnosis occurs less frequently than that for males. Approximately 70%–75% of young cancer survivors are interested in parenthood but the numbers of patients who access fertility preservation techniques prior to treatment are significantly lower. Moreover, despite existing guidelines, healthcare professionals do not address fertility preservation issues adequately. Only a small number of patients at risk of ovarian failure is referred to specialists to discuss fertility preservation options. Unfortunately, there is limited published data on large cohorts of female patients who received pretreatment counseling. Embryo cryopreservation is one of the methods available to females to preserve fertility; however, this technique is not allowed in Italy. Recently, substantial improvements have increased the available options, specifically oocyte and ovarian tissue cryopreservation. Patients should be counseled about fertility preservation strategies and need to know which options are the most practical for them. We report the experience of the San Raffaele Oncofertility Unit in this regard. Data from patients referred to the San Raffaele Oncofertility Unit after cancer diagnosis and before gonadotoxic treatment between April 2011 and June 2014 were retrospectively analyzed. During counseling, a gynecologic oncologist, a reproductive gynecologist, and a psychologist evaluated the patient together. Patients less than 41 years of age could be referred to fertility preservation strategies. An anti-mullerian hormone (AMH) test was proposed as a marker of ovarian reserve (tested before the treatment, 6 and 12 months after the treatment, and then once every year). The prepubertal girls and women that could not delay chemotherapy were referred for ovarian tissue cryopreservation. Ovarian biopsies were obtained during laparoscopic surgery. The patients at reproductive age and in whom ovarian stimulation was not contraindicated were referred for oocyte cryopreservation. The patients with hormone receptor-positive breast cancer received letrozole or tamoxifen during ovarian stimulation. Women who refused or were excluded from fertility preservation strategies received ovarian protection by medical therapy (oral contraceptives). Clinical information including age, type of tumor, stage, planned oncologic treatment, prognosis, hormonal test results, fertility preservation desire, fertility preservation strategy, and outcome were collected in a database. Ninety-six patients were referred after a cancer diagnosis and before gonadotoxic treatment for evaluation to the San Raffaele Oncofertility Unit between April 2011 and June 2014. The mean age was 27 years (range, 3–46 years). Of the 96 patients, 30 (31.2%) were affected by breast cancers, 20 (20.8%) by sarcomas, 28 (29.2%) by hematologic malignancies, 13 (13.5%) by central nervous system cancers, 3 (3.1%) by bowel tumors, 1 (1.0%) by Wilms’ tumor, and 1 (1.0%) by a thyroid tumor (Table 1 ). Of all patients, 73 (76.0%) were referred from other hospitals, whereas 23 (24.0%) were referred from the San Raffaele Hospital. Among the 96 patients, 40.0% (12 of 30) and 39.2% (11 of 28) of the patients with breast cancer and hematological malignancies, respectively, were treated for tumors at the San Raffaele Hospital, whereas 100% (20 of 20) of the patients with sarcomas were treated for the tumor elsewhere and referred to San Raffaele Hospital only for fertility preservation. Twenty-nine patients (30.2%), with a mean age of 31 years (range, 17–46 years), were not recruited for fertility preservation techniques (Table 2 ). 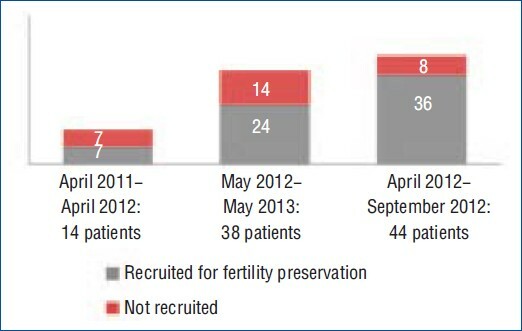 The number of patients referred to the San Raffaele Oncofertility Unit for evaluation increased over time during the 3 years, whereas the rate of patients who were referred and were not recruited decreased over time [April 2011–April 2012: 50% (7 of 14); May 2012–May 2013: 36.8% (14 of 38); June 2013–June 2014: 18.1% (8 of 44)1, as shown in Figure 1 . The patients referred to the San Raffaele Hospital Oncofertility Unit between April 2011 and June 2014. The number of patients referred for evaluation increased while the rate of patients who were not recruited for fertility preservation decreased over time. A total of 47 patients (48.9%), with a mean age of 27 years (range, 17–38 years), were referred for oocyte cryopreservation before starting chemotherapy. Of the 47 patients, 17 (36.2%) were affected by breast cancer, 10 (21.3%) by sarcomas, 15 (31.9%) by hematologic malignancies, 3 (6.4%) by nervous system tumors, 1 (2.1%) by a rectosigmoidal tumor, and 1 (2.1%) by a thyroid tumor. The mean level of AMH in the group receiving oocyte cryopreservation was 1.7 ng/mL (range, 0.1–7.8 ng/mL). Five patients failed the procedure of oocyte cryopreservation (1 for premature luteinization, 3 for failed synchronization, and 1 for failed preservation). The mean number of retrieved oocytes in the patients with cancer was 10 (range, 1–26), and the mean number of frozen oocytes was 7.5 (range, 1–21). The mean time between the patient’s counseling and oocyte retrieval was 15 days (range, 2–37 days). Twenty patients (20.8%), with a mean age of 15 years (range, 3–33 years), were referred for ovarian tissue cryopreservation. Of the 20 patients, 10 (50%) were affected by nervous system tumors, 5 (25.0%) by sarcomas, 1 (5.0%) by breast cancer, 1 (5.0%) by Wilms’ tumor, and 3 (15.0%) by hematologic malignancies. The mean time from the laparoscopic surgery to the beginning of chemotherapy or radiotherapy was 4 days (range, 2–10 days). Advancements in cancer diagnosis and treatment have a significant impact on cancer survival rates. Therefore, quality-of-life issues, such as fertility preservation, have become paramount in the lives of reproductive-age women who are battling malignancies and an integral component in cancer management. Moreover, women are increasingly postponing childbearing to later in life for social or financial reasons, and the incidence of most cancers increases with age. In female patients, the risk of menopause-related complication and infertility at a young age due to cancer treatment may be devastating and be considered a loss of their essential femininity. A recent study showed that undergoing fertility preservation improves the patients’ subjective experience of cancer treatments. However, only a small fraction of patients at risk of premature ovarian failure are referred to specialists to discuss fertility preservation options. Studies have shown that oncologists infrequently discuss fertility preservation options with their patients or refer their patients to infertility specialists[8,15,16]. The priority of the oncologists is to treat the malignancy, and they are reluctant to introduce this issue that could add stress to the patients, especially if the prognosis is uncertain. The patients themselves may be very hesitant to delay treatment for any reason. Recent research on young adult female cancer survivors indicates that there are many barriers to fertility preservation In particular, a significantly higher prevalence of high decisional conflict was observed in participants who were not referred for fertility consultation and in participants who reported that the cost of fertility preservation services was prohibitive. Moreover, religious, cultural, and ethical barriers may prevent fertility preservation options from being discussed with the patients. In addition to those factors, for many physicians there is a lack of training in fertility-sparing procedures or awareness of the new emerging options for fertility preservation. Oncofertility is a new interdisciplinary field that involves gynecologic oncologists, reproductive medicine gynecologists, biologists, general oncologists, psychologists, and endocrinologists in a common objective to provide fertility preservation options for cancer patients[20,21]. In this study, we reported our 3-year experience of fertility preservation at the San Raffaele Hospital. Several meetings in hospitals have been organized to explain fertility preservation strategies, the selection criteria, and the role of the Oncofertility Unit at our hospital. The number of patients referred to our Oncofertility Unit for evaluation has increased over time. More interestingly, the number of patients who were not referred for fertility preservation technique decreased over time, showing an improvement in referrals to the Oncofertility Unit and in the patients’ counseling and understanding. The higher rate of oncofertility procedures since the beginning of our experience is most likely linked to both more appropriate referrals and more directive counseling. The cooperation between specialists is important to evaluate the best option for the patients. The diagnosis of cancer in a young woman represents a reproductive urgency: the first evaluation should be dispatched in a few days, possibly one day. A short waiting time helps to overcome the patients’ fear of delaying treatment, which is the first cause of rejection of fertility preservation techniques. Oocyte cryopreservation is an option if chemotherapy can be delayed, giving patients with cancer the hope of a successful pregnancy when they have overcome their disease. This method required 2–6 weeks of ovarian stimulation depending on the menstrual phase. Fortunately, newer random-start stimulation protocols can be initiated in the follicular or luteal phase, reducing the length of time to oocyte retrieval and minimizing treatment delay. In this study, these young women exhibited a weaker response to controlled ovarian stimulation than expected for their age (a mean of 7.5 cryopreserved oocytes), showing a possible adverse association between the disease and the response to ovarian stimulation. In a recent meta-analysis conducted on 7 retrospective studies, women with malignancies had fewer total oocytes retrieved after controlled ovarian stimulation for fertility preservation compared with healthy age-matched patients (11.7 ± 7.5 versus 13.5 ± 8.4, P = 0.002). So far, 30 term pregnancies have been reported after reimplantation of cryopreserved ovarian tissue. Although still considered experimental, ovarian tissue banking is indicated when there is no time to delay for chemotherapy or for prepubertal girls. Using minimally invasive techniques, a small amount of cortical ovarian tissue is retrieved, frozen, and preserved for future use. For our patients who were referred for oocyte cryopreservation, the mean time from the counseling for oocyte cryopreservation to oocyte retrieval was 15 days; for patients referred for ovarian tissue preservation, the mean time from surgery for ovarian biopsy to the beginning of radiotherapy/chemotherapy was only 4 days. The fertility preservation treatment does not affect the oncologic treatment, and this aspect should be stressed during the counseling. Patients who refuse or are excluded from fertility preservation strategies received ovarian protection by medical therapy. Controversy exists regarding benefit of gonadotrophin-releasing hormone agonist (GnRH-a) or combined oral contraceptives administered at the time of cancer therapy in preventing premature ovarian failure in women, and the available data from both human and animal studies have been mixed. However, more evidence is necessary to offer the routine use of GnRH-a for women as a plan for gonadotoxic therapy We offer oral contraceptives because of the psychological role: women do not experience amenorrhea or hormonal deficit and avoid pregnancies during oncologic treatment. Advances in cancer treatment allow women to be cured and live longer. A discussion on reproductive options and the results of fertility outcomes in cancer patients should form an integral part of the pretreatment counseling process for cancer patients. A multidisciplinary approach and network between treating oncologists, reproductive gynecologists, and additional support professionals is essential to present the most updated information in the decision-making process and for prompt referrals and treatment. Although not all patients will be referred for fertility preservation strategies, all women should be counseled about available options and have the opportunity to exercise their reproductive choice.